Badr's "radicalism" is well documented. On various occasions he has openly declared on live TV that he hates and is disgusted by Christians, that he will "cut the tongue" of anyone who offends Islam (adding "Let the whole world burn, but Islam not be mocked"), and that those Egyptians protesting against Morsi are "mischief makers" who should be "hung on trees" (a distinct allusion to Islamic crucifixion as prescribed in Koran 5:33). Interestingly, he was recently arrested again, but not for the aforementioned hate-mongering and incitements to kill those against Morsi, but rather for insulting an Egyptian actress on live TV, calling her among other things, a "whore." At any rate, under Hosni Mubarak, Badr and other intolerant Islamic supremacists were imprisoned. Under Muhammad Morsi, Badr—as well as numerous jihadis who were on death-row for their acts of terror—have been freed. 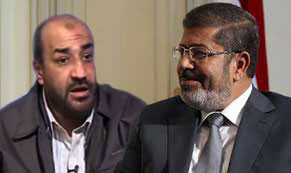 This, too, speaks volumes concerning the behind-the-scenes relationship between the Brotherhood and jihadis. Then there is radical cleric Wagdi Ghoneim, who was sentenced to five years under Mubarak and banished from Egypt for his anti-infidel hate-mongering—again, only reportedly to return under Morsi. He too is as radical as they come. For example, after cursing the late Coptic pope to hell and damnation during his funeral, he openly threatened Egypt's Christian minority with genocide. Among other "pledges of loyalty" to Morsi, he has incited Muslims to wage jihad on and even kill anyone protesting against the Muslim Brotherhood president, portraying such Muslims as apostates who want to see Islam wiped out of Egypt. Salafi sheikhs Badr and Ghoneim are in good company. Months back, any number of radical clerics went out of their way to show their support for Morsi—including by issuing fatwas calling for the deaths of any and all Egyptians who protest against his rule. Thus Islam's most radical Salafis and jihadis see themselves as defenders of the "moderate" Muslim Brotherhood, even as Western analysts and policy makers insist there is a deep divide between the "moderate" Brotherhood on the one hand, and the "radical" Salafis on the other. Yet the question remains: If Morsi and the Brotherhood are "moderates"—or, as U.S. Director of National Intelligence James Clapper once described them, "largely secular"—why do the most vile "radicals" fully support them? Could it be that the dividing line between them—a line which hopeful or naïve Western policymakers are heavily banking on—is not so stark after all, is not so black and white? In fact, radical Salafi support for "moderate" Morsi is simply a reflection of the fact that the radicals, the Salafis and jihadis—as opposed to many Western leaders and analysts—understand and fully support the Muslim Brotherhood president's agenda: the establishment of full Sharia law in Egypt. And, once empowered, Sharia has no black and whites—this they all know. "…he openly threatened Egypt's Christian minority with genocide." I don't know if that's IPT's semantic error, or Wagdi Ghoneim's. If Egypt's Christian minority is largely "Egyptian," how can it be threatened with "genocide"? Shouldn't the term be something like "religocide" or "religious cleansing"? Is there a specific term for extinguishing the membership of a religious group when it is of same ethnic group (assuming Egyptians can be legitimately deemed of the same ethnic group, as Indian Hindus and Muslims are)?